Whether you’re a local or travelling through Brisbane, there’s no denying how great a decent burger joint can be. 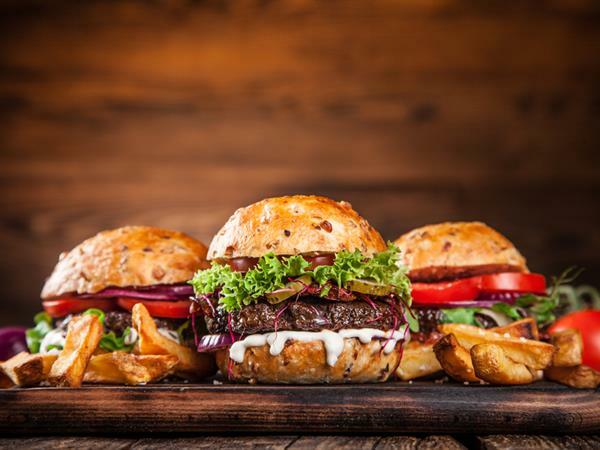 Although a simple kind of meal, the burger has evolved steadily over the past few years and has certainly made it’s way to becoming a top trending food across the country. New York-style burgers have been cropping up all over the place, with New York helpings of meats and cheese between fresh bread buns. With so many great burger places to choose from, it’s important to spend your time wisely, with a burger that is truly deserving of your time (and money!). We have scoured the city of Brisbane to find the best burgers in the city. 69 Amazing burgers are on the menu at Just Poppy’s. There’s even a sly burger that isn’t listed called the “Superbiff”. With four beef patties, four lots of cheese, onion and double bacon, it’s a real treasure. Many people have been travelling to Just Poppy’s to get a chance to eat this mighty burger. If this much burger is too extreme, they have many other options including meat-free, chicken and pork burgers. Grilling Art have a wide selection of burgers to suit a variety of tastes. It doesn’t matter if you’re looking for a simple feed or a burger that is out of this world, Grilling Art have it. Even if it isn’t specifically on the menu, you can add in some of your favourite burger toppings such as avocado (fresh, smashed or spread), beetroot, bacon or even another beef patty. They also have a selection of homemade sauces and gluten free bun options. The Brass Barrel in Rosalie has a number of excellent choices, even if you’re not after a big burger feed. One of the best extras you can add to your burger of choice is maple bacon. The signature burger is the Black Brioche Burger, made with a homemade Wagyu beef patty on their signature black bun, with candied onions, American jack cheese, maple bacon and their secret sauce. Classic burgers are the name of the game at Ben’s Burgers. Their classic beef burgers are popular amongst many “Brisbanites” because they know what works, and they continue to do it well. If you’re looking for a bit of an experimental treat, you can’t go past their Elvis burger, which consists of bacon, peanut butter, banana and maple syrup. Not only will you love the great food here, you will enjoy the stunning decor Miss Kay’s has to offer. This well-decorated diner is the perfect place to catch up with friends over milkshakes and burgers. If you’re looking for a challenge, The Big Kay’s Challenge is a must. Set with five beef patties, five slices of cheese, salad and a side of ‘dirty fries’, if you can devour it in under 15 minutes, you will achieve a place in their hall of fame, plus a voucher for your next visit. Otherwise, you can settle for one of their breakfast specials or cheeseburgers. If you’re looking for classic American-style burgers and beer, then the obvious choice is a place that states both in it’s name. Whether you want to dine at their premises or have their food delivered, you can enjoy the wide range of burger styles they have and enjoy a classic beer alongside it. As well as epically large burgers, they also serve their famous hot wings with ranch mayo and sour cream. Like a few of the other burger places listed, Hank’s has a specialty ‘off the menu’ burger called the Colorado. It’s a burger that is definitely not for the faint-hearted! If the Masterchef judges Gary Mehigan and Matt Preston say it’s “...a really great burger”, then it’s likely to be a really great burger. Miel Container is located in the Brisbane CBD and certainly delights the tastebuds. You can either choose to design your own burger or you pick one of their classics straight from the menu. Don’t forget to add some sides such as nacho chilli con carne, sweet potato wedges or onion rings. As their name suggests, Brooklyn Depot is inspired by Old Brooklyn, with burgers, hot dogs, salads and desserts aimed to please all of your tastebuds. Ribs, wings and fries are all readily available to fill any gaps left after your burger. One of the crowd favourites is the Proud Mary burger, which includes Bloody Mary ketchup, crispy deep fried pork belly, lettuce, hickory bacon, caramelised onions and salsa. They also have some fantastic milkshakes on the menu, which you can also order as alcohol beverages for that little something extra. Taps are known for their craft beer selection, and their Fortitude Valley is no exception. They have a great selection of beers and perfect burgers to match. One of their best burgers is the “Clucking Brilliant” burger, incorporating crispy chicken thigh, bacon, cheese, pickled jalapenos and Japanese mayonnaise on a brioche bun. They also have a “Nacho Burger” which (you guessed it) includes corn chips and avocado salsa. Taps have great specials on their chicken wings at various times during the week. Yet another New York inspired burger joint, Red Hook has burgers, tacos, wings and other New York City inspired street food treats. If you’re looking for a great deal on burgers, fries and a couple of Budweisers, the best day to visit Red Hook is on a Thursday. Two meals (for you and a special friend), plus beer will only set you back $35. They also have a pretty spectacular mac ‘n’ cheese dish with added slow-cooked Wagyu brisket and bacon. If you want a serious burger treat, their Resolution Breaker Burger will fit the bill (the name says it all). It doesn’t matter if you’re a burger professional, looking for a mighty challenge or just want a simple burger on a lazy afternoon, Brisbane is home to some of the best burgers in the whole country. There are many eateries across the CBD and surrounding suburbs to help you fulfill your burger craving. With an assortment of sides and delicious drinks to top your burger off, you’ll have no trouble finding a great burger feed during your stay in Brisbane.